The FS-i6S transmitter and FS-iA6B receiver constitute a 10 channel 2.4GHz AFHDS 2A digital proportional computerized RC System. This system supports quadcopters. The AFHDS 2A (Automatic Frequency Hopping Digital System Second Generation) developed and patented by Flysky is specially developed for all radio control models.Offering superior protection against interference while maintaining lower power consumption and high reliable receiver sensitivity,Flysky's AFHDS technology is considered to be one of the leaders in the RC market today. Capable of sending and receiving data,each transmitter is capable of receiving data from temperature,altitude and many other types of sensors,servo calibration and i-BUS Support. This systems bandwidth ranges from 2.4055GHz to 2.475GHz. This band is divided in 140 channels. Each transmitter hops between 16 channels (32 for Japanese and Korean versions) in order to reduce interference from other transmitters. The high efficiency Omni-directional high gain antenna cuts down on interference,while using less power and maintaining a strong reliable connection. Each transmitter and receiver has its own unique ID. Once the transmitter and receiver have been paired,they will only communicate with each other,preventing other systems accidentally connecting to or interfering with the system's operation. The system is built using highly sensitive low power consumption components,maintaining high receiver sensitivity,while consuming as little as one tenth the power of a standard FM system,dramatically extending battery life. 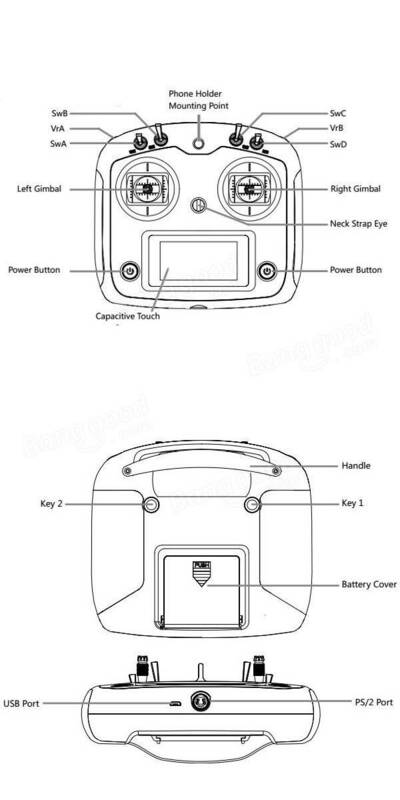 Note: The Self Centering Throttle Mode transmitter is with the white plastic bracket,the Mode 2 transmitter is with the metal bracket.